Germans reach near Maricourt while Bapaume and Nesle are lost and after a sturdy defense by the Manchester Regiment German troops occupy the village of Achiet Le Grand. At Bois Favieres near Maricourt, France when the enemy has penetrated a wood on the right of his line and there is a grave danger that the flank of the entire position will be turned Acting Lieutenant Colonel William Herbert Anderson (commanding 12th Highland Light Infantry) gathers the remainder of his two companies, counter-attacks and drives the Germans from the wood capturing 12 machine-guns and 70 prisoners. Later he will lead another counter-attack which results in the enemy being driven from his position but he is killed at age 36 fighting within the enemy’s lines. He will be awarded a posthumous Victoria Cross for these actions. He has three brothers who have already died in the Great War and was the President of the Junior Imperial Unionist prior to the War. Captain Nigel Duncan Ratcliffe Hunter MC (Royal Engineers) is killed at age 23 near Biefvillers near Bapaume. He is a Great War Poet. Second Lieutenant Walter Daniel John Tull (Middlesex Regiment) is killed while leading an attack on a German trench at age 29. He is the second black professional football player in history when he joins Tottenham Hotspur. He moves to Northampton Town in 1911 and plays over one hundred games for the two teams scoring nine goals from midfield. 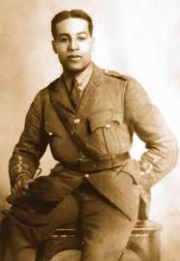 He is also the first black officer to be commissioned in the British Army and the grandson of a slave. Lieutenant Colonel Alan Roderick Haig-Brown DSO (commanding 23rd Middlesex Regiment) is killed at age 40. He is the son of the late Reverend Canon William Haig-Brown Master of Charterhouse. Lieutenant Colonel William Gemmill DSO (commanding 8th Royal Scots) is killed at age 40. Captain James Thompson Nesbitt (Royal Field Artillery) is killed in action at age 32. He is the son of Major D A S Nesbitt JP. Captain Edward Percival Cropper MC (West Yorkshire Regiment) is killed in action. He is the son of the Reverend James Cropper Rector of Wombwell. Captain Reginald Alderson MC (Lancashire Fusiliers) is killed in action at age 23. He is the son of the Reverend Henry Everingham Alderson Vicar of St James Hope. Captain Vere Arthur Edmonstone Elliott (Royal Field Artillery) a 24 year old Rhodes Scholar is killed in action. Captain Valentine Shearman (Royal Scots) is killed at age 30. He is the son of ‘Sir’ Montague (Mr. Justice) Shearman. Captain Cyril John Patrick Lowry (West Yorkshire Regiment) dies of wounds in the arms of his brother Eric at age 20. His brother will be killed in six months serving as the commanding officer of their battalion. Their only other brother was killed in June 1915 on Gallipoli and both of their nephews, the only sons of their sister will be killed in Burma in World War II. Captain William James Ewen (Royal West Kent Regiment) is killed action. His brother was killed last year. Captain Hugh William Eames Barwell MC (Royal Flying Corps) is killed at age 25. His brother was killed last month also serving in the Royal Flying Corps. Captain James Robert Blake (Worcestershire Regiment) is killed at age 24. He is the son of the Reverend Canon James Edward Huxley Blake Vicar of Bretforton. Canadian flying Ace Flight Commander Frederick Carr Armstrong DSC (Royal Naval Air Service) is killed in action at age 21. He is officially credited with thirteen victories. Lieutenant Gordon Smith Mellis Gauld MC (Royal Field Artillery and Royal Flying Corps) is accidentally killed at age 24 while training with Second Lieutenant Alexander Drysdale who is also killed. Lieutenant Gauld is the son of the Reverend William Gauld. Lieutenant Reginald Alexander Forbes Downie (Cameron Highlanders) is killed at age 19. His brother died of wounds in January 1916. Lieutenant Raymond Willis (Cavalry Reserve attached Hussars) is killed at age 37. His brother will die on service in July of this year. Lieutenant Paul Dominie Wilmot (Sussex Regiment) a 29 year old Rhodes Scholar is killed in action. Lieutenant Edward Gilbert Cunliffe (Lancashire Fusiliers attached Machine Gun Corps) is killed at Ypres at age 24. His brother died of wounds in August 1917. Second Lieutenant Thomas Noel Heath Stretch MC (Army Service Corps attached Machine Gun Corps) is killed in action at age 24. He is the son of the Right Reverend John Francis Stretch, Bishop of Newcastle, New South Wales. Second Lieutenant John Battye (Yorkshire Regiment) is killed in action six days prior to his brother being killed. Their father died on service in 1901 in Kroonstad, South Africa while serving as a Color Sergeant in the regiment his son will obtain his commission. Second Lieutenant Geoffrey Sidebotom Parker Stamper (Sherwood Forester) is killed at age 29. His brother will die on service in November and they are sons of the Reverend William Parker Stamper Vicar of Stonebroom. Sergeant John MacKenzie MM (Seaforth Highlanders) is killed at age 22. He is the last of three brothers who are killed in the war. Lance Sergeant Edmund Oldrieve Greenhill (North Staffordshire Regiment) is killed in action at age 41. His is the schoolmaster at Leigh School. Corporal Victor Holland (Irish Regiment) is killed at age 23. He is a member of the Comedie Anglaise Company as Victor Regent. Corporal John Harvey Bainbridge Kayss MM (Eastern Ontario Regiment) dies at home on service at age 23. He is the son of the Reverend John Bainbridge KJayss Vicar of Wighton. Corporal William Bain (Seaforth Highlanders) is killed at age 21. His brother was killed 4 days earlier. Lance Corporal Melville Chiswell (Lancashire Fusiliers) is killed at age 32. He is a leading member of the Raynor Repertory Company and appeared in Shakespearean revivals under the banner of the late Richard Flanagan at Manchester. Able Seaman Joseph Missin (Howe Battalion, Royal Naval Division) is killed in action. His brother will be killed in August of this year. Private C Booth (Machine Gun Corps) is killed in action at age 22. His brother was killed the previous October. Private Lachlan McLennan (Seaforth Highlanders) is killed in action at age 22. His brother Murdo will also fall. Private Alfred Cuthbert Gash (Berkshire Regiment) is killed in action at age 21 at Arras. His brother was killed last September. Private John Hills (Leicestershire Regiment) dies of wounds. His brother will be killed in August of this year. Private Alex MacGregor (Gordon Highlanders) is killed. His two brothers will lose their lives in the Great War. Rifleman Alfred Charlewood (King’s Royal Rifle Corps) is killed at age 24. His brother was killed in July 1916. Private David S U Ross (South African Regiment) is killed at age 14 years and 3 months. Private John Bater (East Yorkshire Regiment) is killed at age 29. He is the middle of three brothers who are killed in the Great War. Private John Hills (Leicestershire Regiment) dies of wounds. His brother will be killed in August. Private Leonard George Bramer (Highland Light Infantry) is killed at age 22. His brother was killed in June 1917. Private William Kemp (Cheshire Regiment) is killed at age 22. His brother will be killed in September.